Today it is my Mother’s birthday and again I faced that perplexing dilemma: what to give her. Every year, I want to give her something that she will really like – but what is that something? It was with much delight that I rediscovered a picture book from my own childhood. 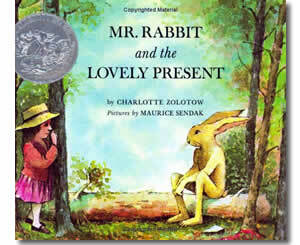 Mr Rabbit and the Lovely Present is written by Charlotte Zolotow and illustrated by Maurice Sendak. This is about this very dilemma! Fancy that! It is the story of a little girl who is looking for a birthday present for her mother. She enlists the help of Mr Rabbit as she has “nothing to give her”. She is keen to give her something that she likes – just like me. Together, they think about what her mother likes. The first thing the little girl thinks of is red “she likes red”. So Mr Rabbit suggests things that are red, because you can’t just give red – red underwear, red roofs, red birds, red fire engines and finally red apples. She likes red apples – sensible woman. The conversation between the little girl and Mr Rabbit is refreshingly understated. The little girl feels all sorts of emotions as they think about each coloured object – sometimes it is horror, or uncertainty and excitement when she finds the perfect object – but it is the illustrations and what is not said that captures these emotions. It is a beautiful story of a little girl finding that perfect gift for her mother – a basket of fruit – red apples, yellow bananas, green pears and blue grapes. It has not cost any money to buy – she has found and collected beautiful things and reused a basket that she already owns. The little girl is thoughtful and Mr Rabbit ever so patient. I remember borrowing this book from our local library and reading it as a little girl – probably about five or six. I also remember the first time I used my own pocket money to buy something for my mother. I would have been about seven or eight, and I walked to our local shopping centre on my own and found a glass vase that would fit a single rose bud. My Mum’s name is Rose, so I thought this was a very good gift and even better, I had enough coins to pay for it. I do remember though that Mum always told us that she would love to be given something we had made, like a card or a cake – I used to love baking and was given free reign of the kitchen from a young age. Back to Mum’s birthday today. Keith found the perfect gift for her a few weeks ago while browsing Glee Books in Blackheath – The Naming of Names by Anna Pavord. Mum loves all things botanical, has a green thumb and the knack of creating beautiful gardens, she paints water colour drawings of plants and flowers and can identify plants without trying. It is a beautiful book, filled with exquisite illustrations. But then… we discovered she had bought it for herself! Back to the drawing board. A couple of weeks ago, I visited this gorgeous cafe in a gift shop for brunch with some friends. After eating and chatting we browsed the gifts on display – many of them arranged by colour. Naturally I gravitated towards the blue objects as this is my favourite colour. However, Mum loves green, so I took myself over to the green corner and discovered some lime green beads that I could imagine her wearing. I put them on, then found a green scarf which I also put on – I could imagine her wearing both, but I was not completely sold on either. I then spied a ceramic cream jug – its shape appealed and I could imagine it sitting in my Mum’s house, filled with flowers – either dried or fresh or simply sitting. Mum trained to be a potter, so ceramics are something she loves and appreciates. I put the beads and scarf back. I had found the perfect gift. Well, I will find that out tomorrow when I give it to her! 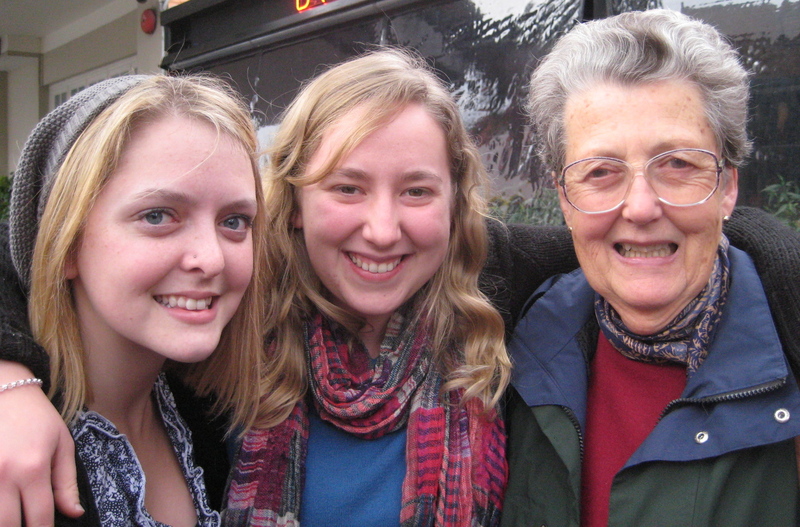 This is my Mum with two of her Granddaughters – Susannah and Laura. Happy birthday Mum! Back to the book – Charlotte Zolotow is a magnificent storyteller. Other favourites include William’s Doll and My Grandson Lew (Unfortunately out of print). This entry was posted in Children's Books, My Life. Bookmark the permalink. Excellent choice Sarah. A most elegant jug. And a beautiful collection of your journey. Thank you! I’m so glad you pointed me to Mr Rabbit and the Lovely Present! Am going to search it out, perfect. My beloved Mum recently turned 70 and asked Dad to give her a Kindle (which she has conquered!) and had us all give her our favourite books as Kindle ebooks! So technical! And such a great idea. They caravan a lot, and she now has a meaningful and wonderful Kindle library.